11 days left on the discount code for 15% discount on all your orders - during January - in our secure webshop! In February it drops to a lower discount! DIY-ers come in all shapes and forms and ages. Mrs M. Lewis, a grandmother from Swansea, decided in June it was high time to restore the original parquet floor in her house. 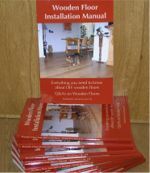 Gaining knowledge about the steps to take from the "7 Easy Steps to Restore/Repair your Parquet Floor" she became confident she could do all the works herself. When she first contacted us, the hardest part - sanding the old finish off - was already done. She just needed to know which finish would be best for her tropical floor and we advised to use the "tropical combo" from Saicos. Saicos doesn't call the combination of the two oil products this way, we baptised it ourselves last year when we had to look for an alternative for the thin oil (Euku oil 1) which, due to VOC regulations, was not longer being produced. Our own experience with Saicos Colour Wax Clear extra thin, followed by one coat of Saicos Premium HardWaxOil (or in lesser traffic areas with Saicos Wax-Polish) proved to us it was a very worthy if not better alternative. (Side-note: Saicos' Colour Wax products are a thin oil and not - as the name suggests - a wax). Tropical wood species are oily of themselves, which, when applying HardWaxOil as first coat, can result in patchy areas when the oil in the HWO can not penetrate the wood enough before the wax part of the HWO starts doing its work. Therefore it is better to apply a thin - single - oil first, which can do its work to penetrate the wood for long term protection undisturbed, followed by one coat of HardWaxOil. This week Mrs Lewis called us again with high praise for the "Tropical Combo". It had been so easy to apply, she told us, and brought out the original grandeur of the parquet floor in no time at all. "And it is so hardwearing! I don't have to worry about the floor when my grand children visit, it doesn't show anything at all." One worry she did have after applying the Colour Wax Clear was the fact it seemed to dry up a bit dull, not what she had expected. But after applying the coat of HardWaxOil the sheen of the original tropical floor showed up, dissolving her fear she had not applied the first coat correctly. "You should explain this better in your guide! You know how people are uncertain about these things, doing this for a first time, and telling them upfront what to expect takes away these uncertanties." The reason Mrs Lewis called us was one little area of the restored floor stayed dull, she thought it might have had something to do with sanding this particular area more than others - closing the grain. Should she apply a second coat of HardWaxOil there? In these cases we recommend to treat the spot with wax or wax-polish first, 9 times out of 10 this solves the dullness and it rather quickly to do. Now she experienced the great result of her first floor restoring project Mrs Lewis has changed her mind about buying new rugs to put on the floors of the bedrooms, covering the original parquet in there. "They are too beautiful to stay covered up really and now I know how well and simple your Tropical Combo products work I'm more than confident I can bring back their grandeur too." In our secure webshop you will find everything you need to repair/restore your own original parquet floor too.